Isolator technology has been an integral part of pharmaceutical liquid filling operations for decades. 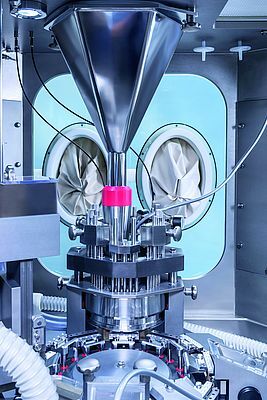 Many of these parenteral drugs must comply with the highest possible quality standards and are therefore protected from contamination during production and filling. Consequently, the main task of isolator technology is to ensure absolute sterility, thus protecting the product and hence the patient from any kind of exterior influence. In OSD production, it is of course equally important to protect drugs and patients from any harm. However, the focus is slightly different and more towards the operational part. In OSD production, the main challenge lies in protecting the operating staff. Just imagine an operator who has been working with hypnotic agents for an entire day without the obligatory containment protection. How is he supposed to perform his tasks for an entire shift, or even drive his car home? The same – and worse – is true for extremely potent drugs such as oncology therapeutics or hormones, which are also rapidly advancing in OSD. The need for appropriate containment solutions has evolved with the toxicity of the drugs. Containment prevents biological agents from escaping either both into the working surroundings and the external environment. During capsule filling and even more during tablet compression, operators risk exposure to extreme dust development. Containment protects them from the harmful effects of product contact and product residue during all steps of the manufacturing, pressing and filling process. It is quite difficult and awkward to protect staff with Personal Protective Equipment (PPE). Highly potent APIs require closed processing and the use of self-containing equipment. Moreover, containment solutions must also be implemented for sampling, cleaning and maintenance activities. Very strict boundary levels have been defined, which make sure that even an unforeseen leakage will have no negative impact on the operators’ health. These levels are expressed in two different ways: the Occupational Exposure Limit (OEL) is defined in microgram per cubic meter, and is related to the maximum permissible API concentration in the air at a workplace during an eight hour shift. The Occupational Exposure Band (OEB) relates to the toxicology of the API. OEB 5 is the highest level of toxicity, corresponding to a maximum OEL of just 1 µ/m3. If transferred to the Empire State Building in New York, the entire building would only be allowed to be exposed to one-twentieth of a teaspoon of this API. Depending on the pre-defined OEB or OEL, different containment technologies are required to ensure the best possible operator protection. Containment systems can be built around existing equipment. They require closed containers or biological safety cabinets, rooms with specially designed air handling and secure operating procedures, as well as containment interfaces, such as infeed, outfeed and de-dusting. What makes them so complex is the required sealing properties. Containment systems must be sealed as completely and as reliably as possible according to the defined OEB and OEL levels– not only during filling or pressing operations but also during sampling, maintenance and cleaning operations. All-round, inflatable seals make sure the contained equipment is optimally closed. Moreover, pressure measurements in the sealing enable operators to react very quickly in case of an unexpected leak. As far as cleaning of contained capsule filling systems is concerned, we can distinguish two main technical options. The more cost-effective solution for products with a lower toxicity level such as orphan drugs or immunosuppressants includes dry, manual cleaning and an optional wetting function. The use of glove ports and hand-held spray nozzles is probably the easiest way to clean the interior. The nozzles and the use of fine mist enable the operator to accomplish the task up to OEB 4 with as little water consumption as possible while binding airborne particles. The most important prerequisite is that all corners and components are easily accessible. At OEB 5, Washing-in-Place (WIP) is not only the safest but realistically the only option. At this level of toxicity, it is even more important to prevent operator faults and to ensure reproducible results. If the washing program is able to store and recall cleaning protocols, WIP processes are reproducible at any time. This is easiest to accomplish with proven technologies and equipment that have been in use for decades. Relying on established processes also enables an easier transfer of containment technologies to other equipment, such as tablet presses. 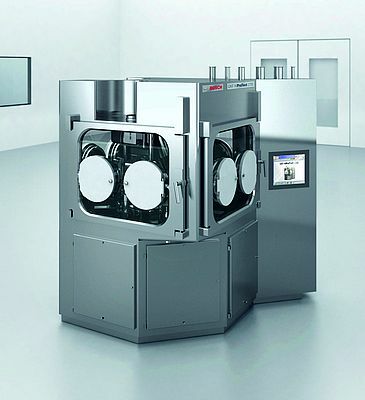 While the main principles of containment remain the same, there is one significant difference: tablet pressing operations develop a much higher amount of dust. These large material agglomerations are difficult to bind with mist. However, the operator can still save large amounts of water resources – if the equipment is designed according to the criteria of accessibility and reproducibility. With the emergence of more and more highly potent OSD, R&D activities are especially important – not only for the development of new drugs, but also of new containment solutions. Since you never know exactly how toxic a drug is going to be until it has been thoroughly tested, R&D processes require especially flexible containment solutions. Before proven otherwise, a new drug will usually be classified as highly toxic during the first phases. Equipment that is able to handle both very small R&D batches and small to medium production batches is the safest option, both in terms of process stability and containment. Some drug manufacturers have already constructed entire containment facilities, where building and equipment are optimally fine-tuned to one another. Involving the equipment supplier at an early planning stage can help save time, space and costs by integrating all required equipment to complete systems, including elements such as the air management system, a WIP center to supply cleaning materials, or an automated remote monitoring system for lights out operation capabilities. 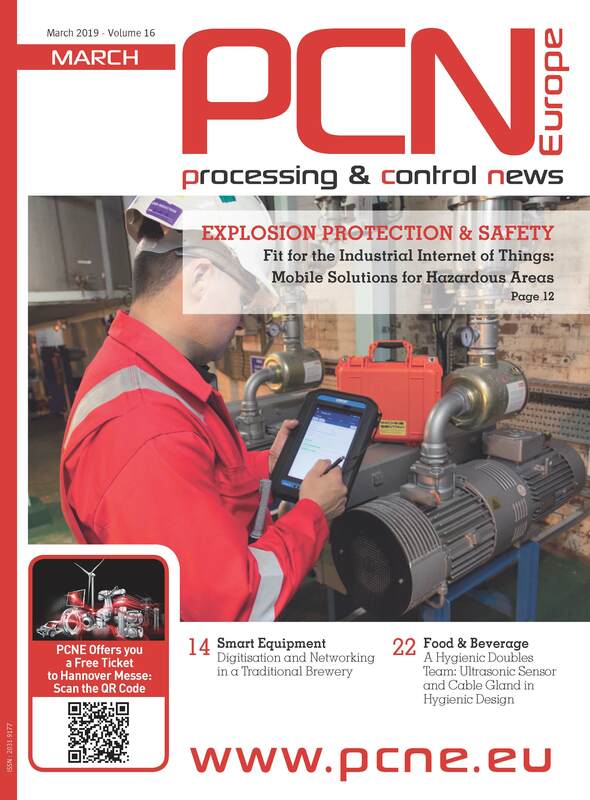 Thanks to the use of sensors and the increasing connectivity of machines and facilities, manufacturers can further increase production flexibility and efficiency – and are well equipped for future containment challenges.